Not many talking points from this game to be honest - Atletico deserved to win but weren't brilliant. So I think I'll leave you there. Thanks for joining me this evening and have a good Saturday night. That's that. Atletico Madrid win on the opening day and Las Palmas acquitted themselves quite well on their first La Liga game in over a decade. Not a terrible day for either by any means. Seconds left - doesn't feel like a goal is coming. Three minutes added on. Can someone be a Las Palmas hero? With Antoine Griezmann having already come off, Koke steps up to take it and his curling effort hits the post and goes wide. Not sure the keeper was getting there. Free-kick to Atletico with 90 seconds left after Vicente Gomez pulled Raul Garcia's jersey. It's Las Palmas's 66th birthday by the way. In 1949 the five teams who played in the Gran Canaria league - Marino, Victoria, Gran Canaria, Atletico and Arenas - all merged to create Las Palmas. If I'm being honest with you I wouldn't be buying the DVD of this game, if such a thing existed. Las Palmas defender Vicente Gomez puts his arm on the shoulder of Atletico Madrid striker Fernando Torres, who goes flying to the ground. The ex-Liverpool man gets booked for diving. Las Palmas captain Aythami Artiles heads a corner over. They've had some chances, the minnows, but not too many real clear ones. And time is running out. Atletico Madrid goalscorer Antoine Griezmann comes off for the ever-beardy Raul Garcia, who is more of a midfielder type. Las Palmas bring on Brazilian Willian Jose for Dani Castellano, that's an attacking change. Nothing to lose now for the islanders. Atletico Madrid left-back Filipe Luis goes on a Lionel Messi style dribble, beating two defenders around the corner of the box and then he tries to blast a shot past keeper Raul Lizoain at his near post but the Las Palmas custodian gets it out for a corner. Fernando Torres of 2008 would score this but the 2015 vintage doesn't. A ball comes through to the striker, who tries to get it onto his other foot near the edge of the box and it's won by a Las Palmas defender. That was Las Palmas's first effort on target, I'm not sure I'd even mentioned Jan Oblak in this live text so far. It was worth the wait. Las Palmas are almost level as Aythami Artiles gets something onto a corner, it's then deflected by an Atletico player and somehow keeper Jan Oblak gets his right arm down to keep it out from creeping it at the near post. Heroic defending by Las Palmas to stay in the game. Filipe Luis bombs forward again on the Atletico left and gets the ball across to Angel Correa but he's denied by a last-ditch tackle by two Yellows defenders. Las Palmas, just trying to be awkward I'm sure, make another change seconds later as Momo replaces Roque Mesa. And Atletico make a change, bringing on highly rated Argentine Angel Correa for Oliver Torres in the attacking midfield region. Las Palmas make a change in midfield, Hernan comes off and Vicente Gomez is on. Can Atletico win the title? Malcolm Hart on BBC Sport Facebook page: "I think they will be looking at 3rd again. I would love to see them up there challenging for 1st but think they lack depth." On comes striker Fernando Torres for Atletico Madrid, with Jackson Martinez the man coming off. Like for like - well in terms of position. Las Palmas almost level against the run of play but David Simon's header at the back post from a free-kick clips the top of the crossbar. Atletico Madrid defender Juanfran enters the book for pulling Sergio Araujo back. Atletico Madrid debutant Jackson Martinez has been pretty quiet tonight but he almost gets on the end of a Filipe Luis cross only for Las Palmas to get it out for a corner. I expect big things from ex-Porto striker Martinez in La Liga this season. Filipe Luis failed to score in 15 Premier League appearances for Chelsea but he wants a goal tonight and has a second effort of the evening although it's to drill a 25-yard effort over. A few Atletico Madrid players are warming up on the sidelines including Chelsea and AC Milan legend Fernando Torres. No changes for either side - Atletico Madrid get the second half going. If you were busy following the Premier League earlier, you might have missed Bayern's remarkable game in Germany. Hoffenheim took the lead with the joint quickest Bundesliga goal ever, Kevin Volland seizing on a misplaced David Alaba pass to score after nine seconds. But Thomas Muller levelled and Robert Lewandowski came off the bench to score a 90th-minute winner. But in between their goals, Hoffenheim had a glorious chance to win it - Eugen Polanski hitting the post with a penalty after Jerome Boateng was sent fof for handball. Roma were held to a 1-1 draw at Verona earlier on the opening day of the Serie A season. Bosko Jankovic gave Veroma the lead but Alessandro Florenzi levelled from distance five minutes later. Roma debutant Wojciech Szczesny, on loan from Arsenal, made a few good saves. Mohamed Salah and Edin Dzeko also made their debuts. Atletico Madrid have had seven shots, but only two on target - one was the goal and the other was that Antoine Griezmann effort about three minutes ago. Las Palmas have only had one effort. It's not been a classic but Atletico Madrid lead 1-0. That's something I said many times in their triumphant 2013-14 season. Late in the first half, Antoine Griezmann finds some space at the edge of the box but his shot is saved by Raul Lizoain. It's been a game of few shots. Filipe Luis, making his first Atletico Madrid appearance since rejoining from Chelsea, has a volley from the edge of the box but he gets it wrong and it's well wide. It flew past several team-mates but none of them could get a touch. A definite lull in this game now, which gave me a chance you update you with French and Spanish scores. The TV commentators have been talking about Las Palmas sub Juan Carlos Valderon for about a minute now. Lazio lead Bologna 1-0 after 22 minutes thanks to Lucas Biglia's goal. In Ligue 1, Monaco are 1-0 down to Toulouse, with Tongo Doumbia scoring after 22 minutes. We're early in the second half there. Roque Mesa fires a long-range effort over the bar, Las Palmas's first shot in the first half an hour. Game has gone a bit quiet at the moment, with neither side pushing the issue too much at the moment. Antoine Griezmann scored 22 La Liga goals last season following his big-money move from Real Sociedad - can he beat that this year? Atletico Madrid lead and it's Antoine Griezmann. He fires a free-kick in from 25 yards and it hits the back of the net. The ball ended up centrally, I couldn't see a deflection but it must have taken one. Either way keeper Raul Lizoain should have done better. Jack Rhys-Burgess: They have proven they are a title challenging team, it's up to Barcelona and Real Madrid to prevent them from winning. If they both do poorly (and they haven't exactly looked great) in comparison Atletico have a great chance of winning. Atletico Madrid, in case you're wondering, are 22-1 to win the title this season. Las Palmas are 10,000-1. Las Palmas have steadied the ship a bit after Atletico's dominant start. But Gabi breaks for Atleti and Sergio Araujo is lucky not to be booked for hacking him down. A few of you on the BBC Sport Facebook page think Atletico Madrid can win the title this year. Replies include "I think so", "Yes", "Why not?" and "no". A good range there. If you have any reasons for your answer let us know! Atletico right-back Juanfran drops a cross in which Tiago heads wide at the far post. Decent start from the hosts. Could possibly be a long night for Las Palmas. First chance of the game as Atletico forward Antoine Griezmann snaps a half-volley wide of the far post with keeper Raul Lizoain scrambling. Las Palmas, playing in yellow, get us under way. A moment's silence before we start, not sure why. Casual La Liga fans might notice at least one name on the Las Palmas bench. Deportivo La Coruna legend playmaker Juan Carlos Valeron is still playing at the age of 40 and helped Las Palmas win the play-offs to seal promotion last year. If he doesn't come on I'll be furious. A classic encounter has just ended in La Liga as David Moyes's Real Sociedad drew 0-0 at Deportivo La Coruna. So do we think Atletico Madrid can challenge for the title again? Real Madrid have a new manager, who didn't set the world alight in his last job at Napoli. Barcelona got thrashed in the Spanish Super Cup and have lost Pedro and Xavi. Let us know using #bbceurofooty on Twitter or comment on our Facebook pages. Atletico Madrid start two of their summer signings, Filipe Luis and Jackson Martinez. Fernando Torres is on the bench. Sergio Araujo starts up front for Las Palmas, having joined in the summer following a successful loan spell last season. Atletico Madrid: Oblak, Juanfran, Godin, Gimenez, Luis, Koke, Tiago, Gabi, Oliver, Martinez, Griezmann. Subs: Moya, García, Torres, Savic, Correa, Niguez, Vietto. Fifteen months ago Atletico Madrid caused one of the major football shocks of reason times when they ended the Barcelona-Real Madrid duopoly and won La Liga. But last season they finished third, 16 points behind champions Barca and 14 off Real. 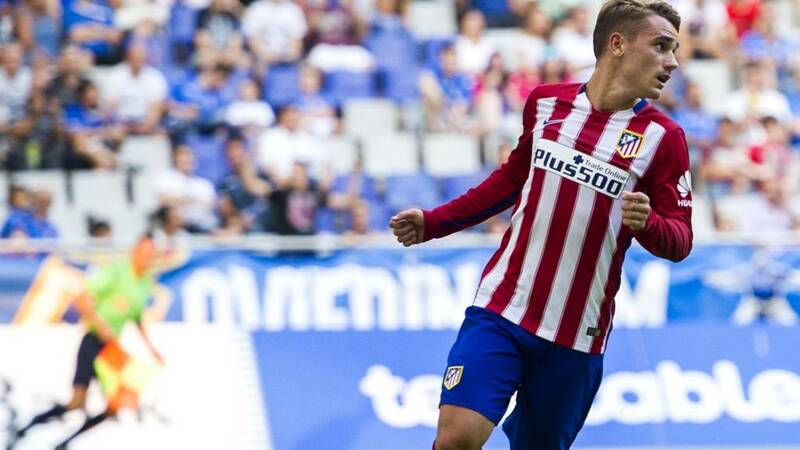 Diego Simeone has signed well this summer, bringing in forwards Luciano Vietto and the explosive Jackson Martinez, playmaker Yannick Ferreira-Carrasco and defenders Stefan Savic and Filipe Luis, a 2014 title winner with Atletico before one year at Chelsea. Will they put up a title challenge this season? Game one of 38 is at home to promoted Las Palmas is tonight.